Editor’s note: “Tons” in this article refers to metric tons, each of which is the equivalent of about 2,204 pounds. U.S. scientists have calculated yet another item on the human shopping list that makes up the modern world: plastics. They have estimated the mass of all the plastic bottles, bags, cups, toys, instruments and fabrics ever produced and tracked its whereabouts – yet another index of the phenomenal change to the face of the planet made by recent human advance. Altogether, since about 1950, with the birth of a new industry, more than 8.3 billion tons of synthetic organic polymers have been generated, distributed and discarded. Of that total, 6.3 billion tons are classified as waste. Of that waste, only 9 percent has been recycled, 12 percent incinerated, and 79 percent of what is essentially indestructible man-made material is either in landfills or polluting the environment. And much of that waste is now in the sea: in 2010, according to a new study in the journal Science Advances, plastic debris has now been found in all the world’s oceans. In 2010, an estimated 8 million tons was swept downriver or blown by the winds into the sea. By 2050, landfill sites could be holding 12 billion tons. “Most plastics don’t biodegrade in any meaningful sense, so the plastic waste humans have generated could be with us for hundreds or even thousands of years,” said Jenna Jambeck, an engineer at the University of Georgia and one of the partners in the study. In the last two centuries humans have become the greatest earth-moving force on the planet, and in paving roads and erecting office blocks, tenements, ports, factories and other structures have created a “technosphere” with a mass of 30 trillion tons. In the course of doing so they have changed the planet so comprehensively that many millions of years from now, evidence of human presence will be marked by at least one geological stratum containing fossilized evidence that could have been left by no other life form. In 1960 plastic made up less than 1 percent of municipal solid waste; by 2005, in middle- and high-income countries, it made up more than 10 percent. The researchers combed through the industry data to compile production statistics worldwide for resins, fibers and additives and to use these to work out the types of plastics now in the environment, most of it as discarded packaging: half of all plastic output becomes waste within four years of use. And in the years from 1950 to 2015, nearly half of all human plastic production was in the last 13 years. “There are people alive today who remember a world without plastics. 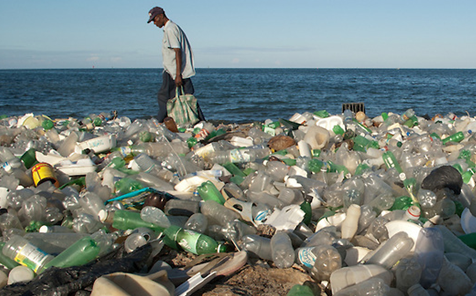 But they have become so ubiquitous that you can’t go anywhere without finding plastic waste in our environment, including our oceans,” Jambeck said. The researchers make the point that plastics do not decompose; they may fracture and divide into ever smaller granules, but they accumulate, often with horrific consequences for wildlife, to create spoil heaps of discarded plastic cups, bottles and bags and other indestructible waste almost everywhere on the ocean shores. “What we are trying to do is to create the foundation for sustainable materials management,” said Roland Geyer of the University of California Santa Barbara, who led the study.